Rotalok - the tough one! 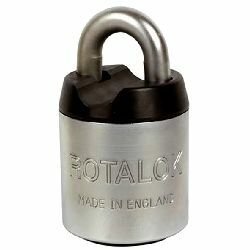 ROTALOK locks have earned an excellent reputation and yet are still very competitively priced against other high security padlocks. They are in use by the MOD and NATO Forces and when the Merseyside Fire & Civil Defence Authority used hydraulic cutters (as carried on emergency vehicles such as Fire Engines) to attack the special steel alloy shackle, the blades on the cutters failed before the shackle could be cut! Remember, when choosing your high security padlock, it is important to recognise that it could be subjected to various extreme forms of attack. Popular types of attack include; drilling, freezing, hammering, lock picking, sawing, cropping and the pipe wrench or stillson. 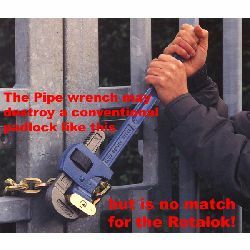 The pipe wrench is one of the most popular forms of attack and will easily destroy all but the most robust conventional style padlock (see image above), but is ineffective against the Rotalok thanks to the clever lock design with its rotating outer sleeve. In fact our unique ROTALOK range of High Security Padlocks offer protection against all of the above forms of attack, and have even been given a NATO Stock Number. Whilst the unique rotating outer sleeve of the ROTALOK prevents any grip or purchase for Pipe Wrench, Stillson, etc. 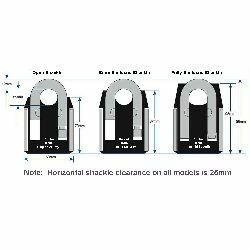 all body parts are constructed in hardened steel, and the special 12mm shackle is specially treated to obtain greater toughness and ductility for given hardness. A double segment anti-drill cut out in the base helps protect against attempts to drill out the lock cylinder. Ideal for use with heavy duty chains (see security chains), heavy duty Padbars, or the special heavy duty shrouded Pad-Bracket. Rotalok is fitted as standard with an Insurance approved 6 pin "Restricted Key" cylinder for maximum security.